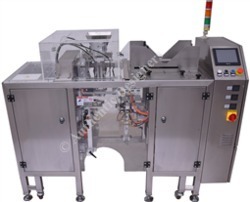 Leading Manufacturer and Exporter from Noida, our product range includes Automatic premade pouch Packing machine, Automatic readymade pouch packing machine, Automatic pouch packing machine with auger filler, automatic pouch packing machine with weigh filler, Automatic pouch packing machine with cup filler, Automatic pouch packing machine with multi head weigher and many more items. Premade Pouches as stand up pouch , 3side seal puch with zip lock/ without zip lock, gusset pouch, flat bottom pouch, doy pack pouch etc. Machine frame & contact part made in SS 304. Adjustable to various pouch size. Vacuum & gas flush system.